Configure settings for your Kegmeisters account. Fill in your Sales Tax as a percentage. With this option turned on, sales tax will be added to the cost of your kegs, and there will be two line items: ‘Keg Price’ and ‘Keg Sales Tax’. With tax turned off, there is only a single ‘Keg Price’ line item. Set your Hand Tap Price if you charge customers to use a hand tap, and set the Hand Tap Deposit and Keg Deposit amounts. Add all your available Keg Sizes you will offer. 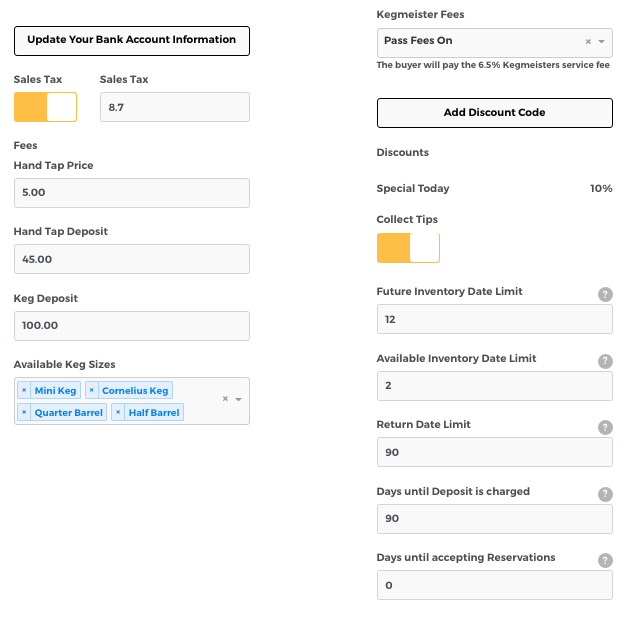 Kegmeisters Fees: the option to Pass Fees On means the customer will pay a 6.5% fee when they buy a keg and see two line items: ‘Keg Price’ and ‘Service Fee’. If you Absorb Fees, the brewery pays the 6.5% fee and there is only a single ‘Keg Price’ line item for the customer. Add any Discount Codes that you would like - the name of the discount code is what you enter during a transaction to receive that discount. Turn Tips either on or off to allow customers to pay a tip (feature coming soon). Update Bank Account Information to add an Account Number and Routing Number. These fields are required to process transactions through Kegmeisters, but we do not store this information in our database for your security. Once your account is created, you can set date limits for deposits, Reservations and Inventory pages, as well as add more users with different Roles on this page.